Good news, my kitchen is finally restocked! Well, I’m excited about that. Hubby and I braved the weird, rainy and cold weather to load up at Whole Foods today. $150 later, I should be good for a while. :-) And it’s been a wonderfully relaxing weekend so far, I slept in, had a lazy breakfast and hit the gym much later after leisurely reading on the internet and drinking way too much coffee. 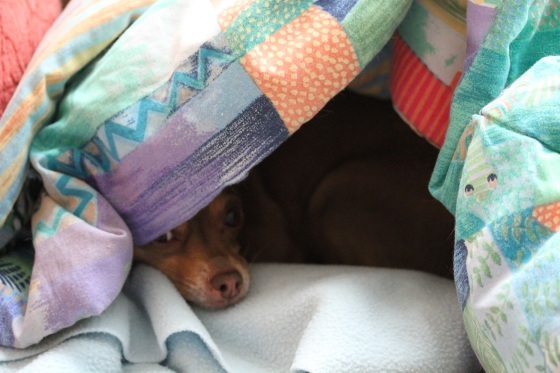 Leela had her own lazy morning buried in her comforter cave, chihuahuas have a talent for tunneling into blankets. 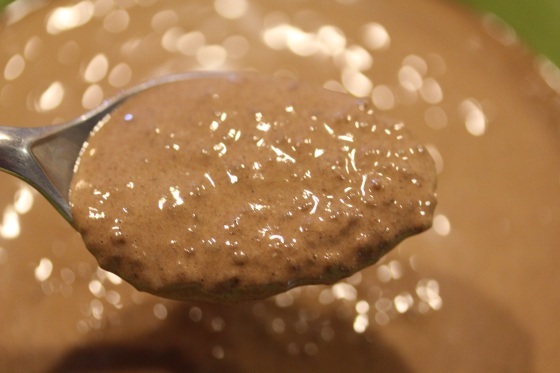 My relaxed breakfast was experimenting with another chia seed pudding recipe involving two more of my favorite flavors – banana and chocolate. 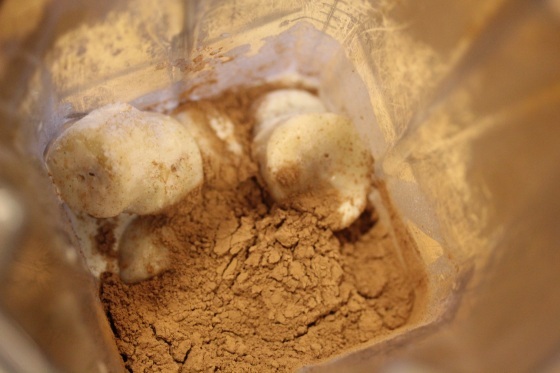 Place all ingredients except the chia seeds into a high speed blender until smooth and creamy. 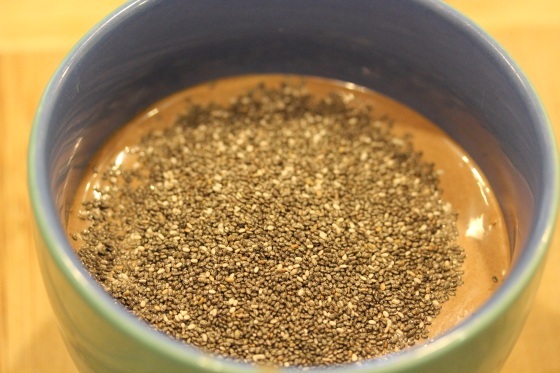 Pour mixture into a bowl and stir in chia seeds. Let sit for 20 minutes stirring occasionally. Enjoy! Makes one serving. The texture was a little soupy, you could use 3/4 cup nut/seed milk if you’re using a fresh banana instead of frozen to thicken it up. I liked to soup-like texture because it was smooth and creamy, oatmeal/banana soft serve-like. 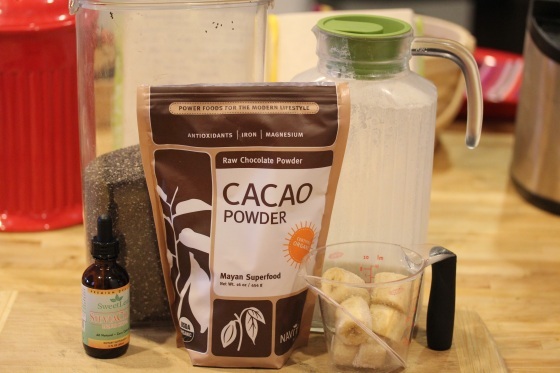 The chia seeds blended well with the creamy pureed banana and rich chocolate flavor, pureed banana and cacao powder is a combo that can’t go wrong for me and even works wonderfully well in this kale chip recipe. Yum!!! 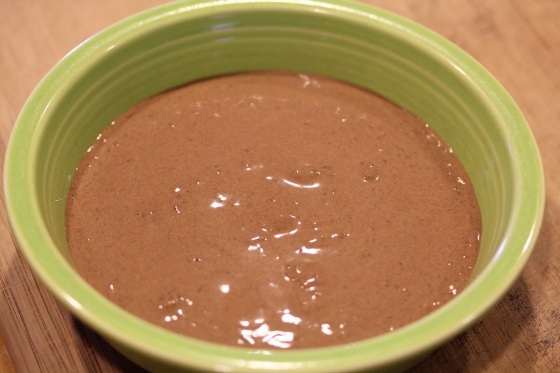 I make banana softserve (chocolate) and chocolate chia seed pudding. But never have I made chia pudding WITH bananas. That’s a combo i must try. Looks like a wonderful dessert-for-brekkie to me! The Sweetleaf is good, it works well in coffee and desserts. I noticed Whole Foods also has their own brand of stevia dropper now that’s $3 cheaper, so I grabbed it to try next. I made this today for breakfast as well. Very yummy! Great recipe! I love chia seeds but I only use them in my smoothies. Gonna definitely try this. I recently wrote an article on the health benefits of chia seeds, check it out and let me know what do you think about it, I would really appreciate it! Any particular reason you don’t also blend the chia? Seems like that might make the texture more pudding like. You could blend them, but I like the gelatinous tapioca texture from chia seeds have been soaked for 20+ minutes.